The Syrian Arab Army (SAA) continued their push into the Al-Safa region of southern Syria, today, after a fierce battle with the so-called “Islamic State” (ISIS/ISIL/IS/Daesh) on Thursday. 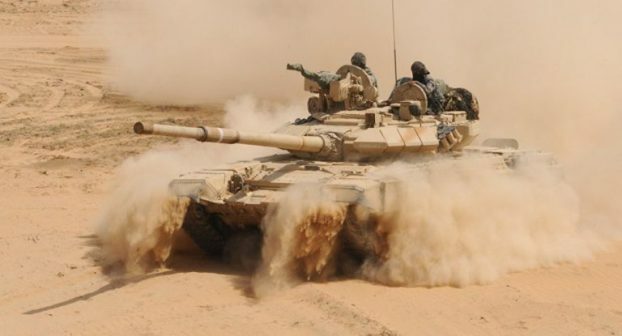 Led by their 4th Armored Division, the Syrian Arab Army began their assault on Friday morning by storming the Islamic State’s positions in the important Qasr Sheikh Hussein area of the Al-Safa region. The Syrian Arab Army would manage to score a small advance in the Qasr Sheikh Hussein area after engaging a large Islamic State force for several hours this morning. According to a military source in Sweida city, the Syrian Arab Army’s attack resulted in the destruction of several trenches and dens that were used by the Islamic State in this rugged region in Syria’s Sweida province. The Syrian Arab Army has now expanded their assault to the southwestern axis of the Al-Safa region, as they look to close-in on the remaining terrorists in the area.